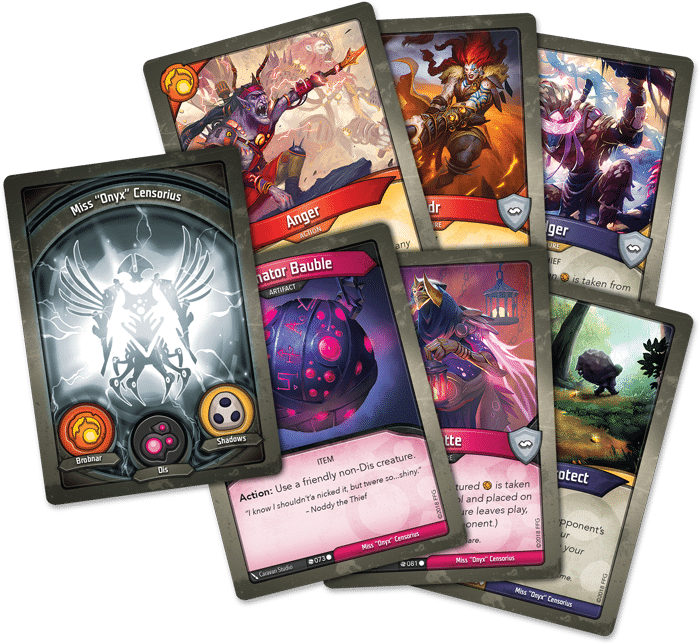 If you are even remotely close to the card game scene then may have heard of a little game called Keyforge by now. 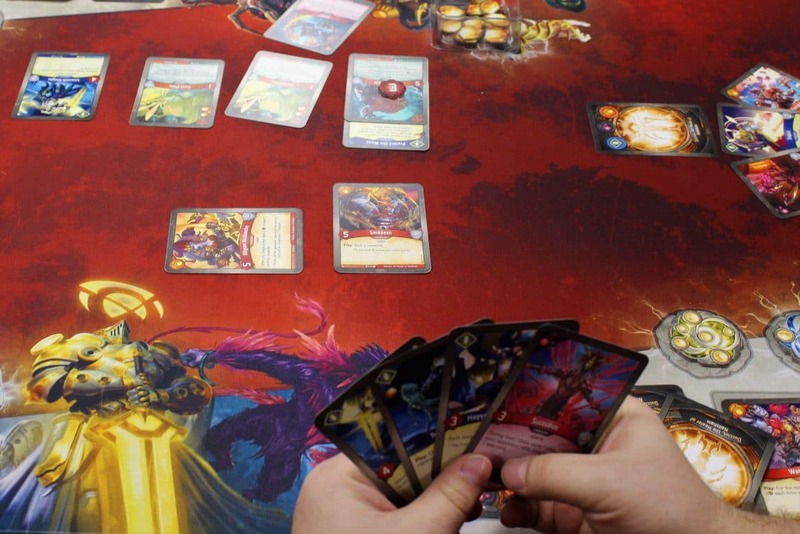 Developed by MtG creator, Richard Garfield, and published by Fantasy Flight Games, Keyforge is the hot new game taking shelves by storm. “But what is Keyforge?” you ask. Well it’s unlike any other trading card game released to date. 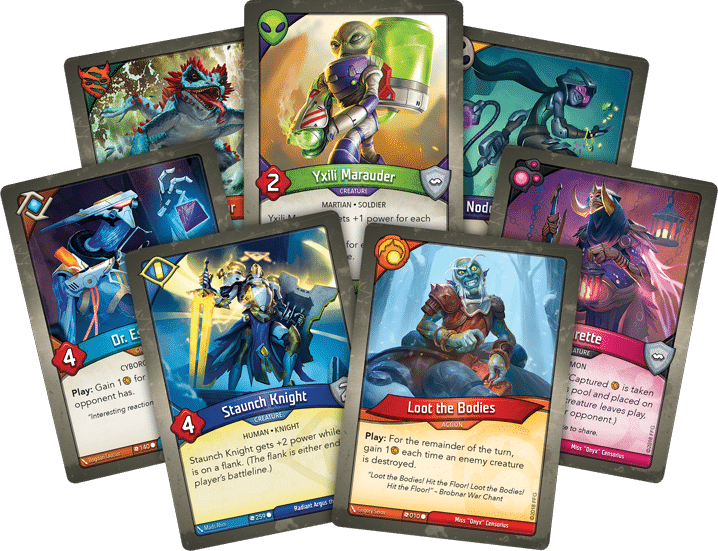 In fact, Keyforge isn’t a TCG at all, but rather a “Unique Deck Game”; the first of its kind. But what is a Unique Deck Game exactly, and how is it different from a regular ol’ TCG? Well, that comes in how the game is distributed. In Keyforge you don’t build a deck from the ground up, you just buy a deck and BAM!, you’re done. What’s cool is that every 37-card deck is unique. Keyforge’s web page boasts that it has over “104 quadrillion possible decks”. That’s a lot of deck combinations. How this is actually done for you is through a series of algorithms, where every deck is built from the set’s list of cards (which consists of 370 different cards). Alas, you aren’t meant to mix and match cards, so there is no deck building element a la MtG or Pokemon. Your deck comes pre-built and done. You can even register your deck online on the Keyforge app and see everyone else’s decks. Soon you will even be able to track games you play with them, as well. Every deck represents an Archon, the key players in Keyforge’s setting, and as such is given a completely unique name. You will be the only person in the world who has this deck with this particular Archon. Some of the names do get pretty out there, to boot. For example, one of my boyfriend’s Archons is called Boomhog, The Ogre that Boxes the Turret. Another is called Mr. Dazdorius, the Apologetic Chieftain. I think I love this the most because it really gets you to bond with your deck, since you will be the only one with these Archons at your side. The procedural aspect to name creation has generated some unfortunate names, however, like the infamous Titanflayer, the Farmer of Racism. But I’m sure the kinks will be worked out of the system in due time. So what is the point of the game and how do you play it? Well, fair friend, let me give you a little context before delving into the nitty-gritty! The setting of Keyforge takes place on the artificial planet called The Crucible. The Archons are powerful natives, “hailed by some as gods”, who seek to discover the secrets of the planet, built for them by the mysterious Architects. The secrets are locked away in Vaults hidden across the planet, therefore the Archons race to unlock and claim these Vaults for themselves. Of course, when two Archons meet, problems will arise! In game terms, the objective of the game is to unlock one of these Vaults before your opponent. The Vaults are locked behind three keystones. The player that forges three keystones unlocks the Vault and wins the game. Keystones are built by collecting a resource called Æmber. Collect 6 Æmber, and you can forge a keystone at the beginning of your turn. Pretty simple stuff, actually. What Is Familiar About Keyforge? But of course, the goal is simpler than the execution. Over the course of a game you will summon all kinds of creatures (reminiscent of Magic), steal and capture your opponent’s Æmber, and perform all sorts of crazy shenanigans to get that edge over your opponent. 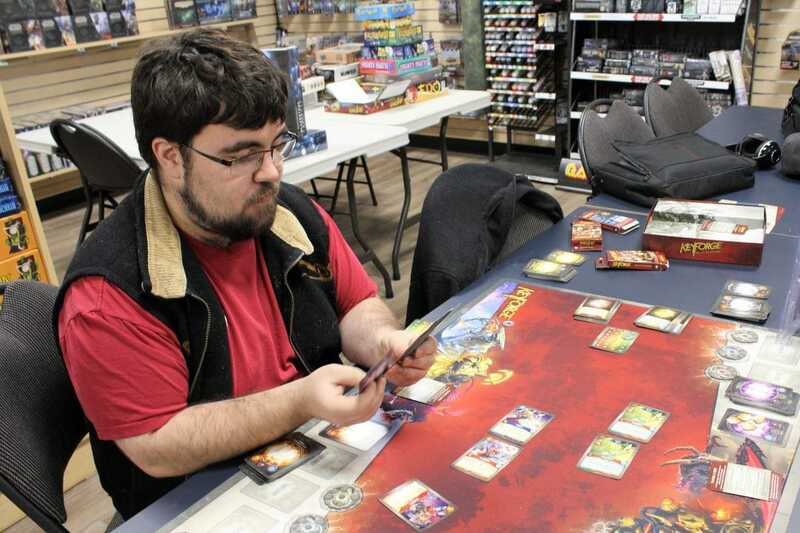 A game of Keyforge plays closely to Magic (and some say, it plays similarly to Hearthstone as well—alas, I have not played Hearthstone so I cannot verify) where you’re constantly seeking to get the advantage over your opponent. Creatures work very similarly to Magic, where you can summon creatures who stay permanently on the “battleline” and do your bidding. Your friendly creatures can fight any of your opponent’s creatures, and both trade blows simultaneously (most of the time). You can also use your creatures to “reap”, which generates Æmber for you to build keystones. Also reminiscent of Magic are the inclusion of “upgrade” cards that enhance your creatures like enchantments, and artifact cards (that work almost exactly like artifacts in Magic). Creatures and artifacts come into play “exhausted” (think “tapped” from Magic) which means you have to wait until they become “readied” (or “untapped”) before you can use them to attack or reap. Likewise doing any action like attacking or reaping will exhaust that creature or artifact. Here is where you MtG players will feel at home with the game. But what’s exciting is how Keyforge differs from the games out there. The key (see what I did there?) difference with Keyforge is that there is no cost to play or use your cards. That’s right: no mana, no energy, no tribute costs, nothing. In fact, many cards will generate Æmber for you just for playing them. The limiting factor with Keyforge is that every deck is made up of three Houses (12 cards each in every deck), which represent a faction in the game’s setting, and at the beginning of your turn you choose which House you want to activate. During your turn you can only play cards, use creatures/artifacts and discard cards from your hand from that House and only that House. This brings a whole different angle of strategy to the game since you’re less worried about resources and more focused on timing. Sometimes you’ll have a hand that’s stacked in one House, but your battleline is filled up with creatures of a different House. Do you play your hand or do you use your army? This is perhaps the coolest (and often trickiest) aspect to the game. There are plenty of cards that get around these rules too, so this adds yet another layer to the strategic insanity. Also different from MtG is that there is relative flexibility in how you play your cards. You can play a card, attack with a creature, play another card and attack with another creature for example. As long as they’re part of the House you’ve activated for the turn, you’re good to go. Part of the fun of the game is finding new ways to mix and match effects of cards during your turn. Brobnar are basically angry giants who love to fight, and focus on doing exactly that. Here you’ll have your big powerful fighty guys, as well as lots of cards that net you Æmber for fighting and/or let creatures from your other Houses fight. Mars are your stereotypical grey alien martians, and generally get better the more other Mars cards are around, otherwise they focus on pretty janky shenanigans (for Magic players think Blue cards and tribal effects). Sanctum are religious knights who generally focus on healing/protecting creatures as well as being defensive fighters. Logos are robots and scientists who generally focus on being able to draw cards but also are able to wipe the battleline of creatures with their explosive experiments. Dis are demons and imps who like to be jerks and focus on penalizing the opponent with punitive effects (Magic players think Control). Shadows are typically thieves who are good at stealing Æmber and evading enemies trying to attack them. Finally, the Untamed are witches/druids and animals that focus on bringing other creatures to the fore as well as being overall very decent fighters. This is just a brief overview of each House and their themes, I do hope to delve a little more into the lore of each House in the future! Overall I’ve had a blast playing the game at my FLGS. The more I play, the more I learn what new craziness I can concoct with my decks. Sometimes TCGs where you can build the most competitive decks in the meta get a little predictable, so it’s a breath of fresh air when you get dealt a deck and you have to make do with it. And judging from the impressions that I’m seeing, I don’t think I’m alone. But why take it from me? Take a gander at Keyforge’s home page and check out the rules for yourself and see what you think!